Realized yesterday that for a well travelled, educated, upper middle-class rich kid my understanding of international geography is downright horrible. I've had a lot of luck with osmosis-by-desktop-wallpaper, so figured that putting the world map on my iMac's desktop would help. I wanted a map that had the vibe of an old nautical chart, but all the wallpapers i could find online were either A) incomplete B) too stylized or C) too ugly. In the end I gave up looking and made a quick and dirty one myself. 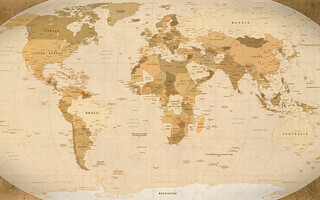 A CIA Factbook political world map combined with a googled parchment texture. No disrespect towards either source was intended. This could be done much better and stylishly, I fully admit, but probably not in the 5 minutes it took to make this. This version was updated to match the 2010 CIA Factbook map. I'd accidentally used the 2006 version previously. 2560x1440 version available here.